Elle is 4.5. She is Temneh. A small African Grey, darker than more more popular. 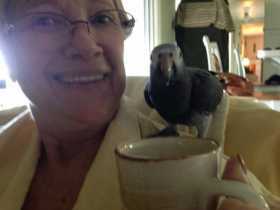 She is Dark Grey with a light grey breast and maroon tail feathers. She is light grey around her eyes and has a translucent beak.